About a year ago, I wrote how PowerPoint-based presentations are a sales killer, and recently an incident in the sports world reinforced my claim. In my post last year, I argued PowerPoints were counter-productive because rather than encouraging a dialogue they presented only what you felt your audience wanted to hear. 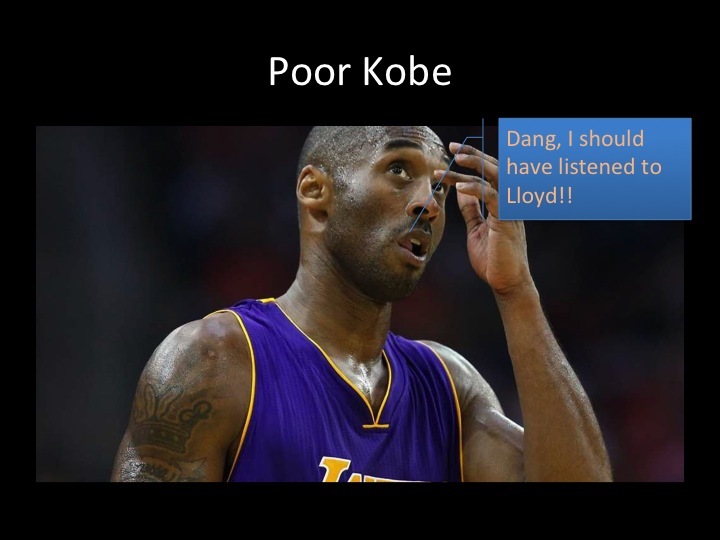 This summer, Kobe Bryant and the LA Lakers learned about the shortcomings of PowerPoints that I described (I’m a little shocked Kobe is not reading my blog regularly, but I guess he was busy rehabilitating). Kobe and the Lakers were trying to entice free agent LaMarcus Aldridge, who was being pursued by multiple NBA teams, to sign with the Lakers. When they met with Aldridge, they put on a beautiful presentation on the benefits of playing with the Lakers and playing in Los Angeles. In reality, Aldridge considered it a disaster because the Lakers did not convince him how the team would become a championship contender. He felt the presentation focused too much on outside opportunities, not on basketball. Aldridge subsequently signed with the San Antonio Spurs. They assumed they knew what Aldridge was interested in. They focused the presentation on opportunities in Los Angeles. They built a presentation they would want to see, not one designed for Aldridge. They assumed the meeting went well based on pleasantries exchanged at the meeting. Rather than a presentation, had a conversation with Aldridge. They should have researched Aldridge—his upbringing, previous statements, past decisions (e.g., which university to attend), etc.—and gotten an understanding of his motivations and key factors rather than guessing it was the same as for their stars. They should have asked Aldridge what was important to him, what he was basing his decision on, rather than assume they already knew. Virtually every meeting feels like it went well. They should have asked Aldridge what were his outstanding concerns, what did they fail to address, what they can do to help his decision-making. While we may not all be trying to sign an NBA big man, almost all of us are in sales situations occasionally. It may be a traditional sales/business development situation, where you are trying to convince somebody to work with you or buy your product. It may be M&A, where you are trying to convince a company to buy you or sell to you. It could be fund-raising, where you are trying to get an investor to fund your company. It may be an internal situation, where you are trying to convince leadership to embrace your strategy. In all of these situations, relying on PowerPoints is not the optimal way forward. Instead, you need to understand your audience and have a conversation with them, creating a solution that is beneficial to both parties. Kobe Bryant and the LA Lakers relied on a slick PowerPoint conversation to try to convince LaMarcus Aldridge to sign with them. Although they felt the presentation went very well, he signed with the San Antonio Spurs. This experience shows the weaknesses of PowerPoints; rather than spurring a conversation, they are one-directional. There are many situations where you are tempted to use PowerPoints—sales, potential investments, internal strategy, M&A, etc.—but in all of these you have a much greater chance for success by talking to the counter-party and creating a solution mutually.